Gold prices today (Tuesday) were up 0.5% to $1,141.10 just before 1:00 p.m. as investors continue to wait on any indication of whether the U.S. Federal Reserve will raise interest rates this month. 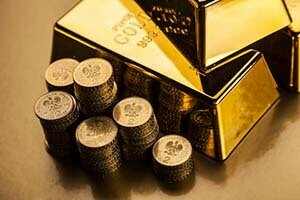 Gold prices hit an intraday high of $1,148.80 earlier in the session Tuesday. The price of gold is climbing because investors believe the Federal Reserve may forego its plan of raising interest rates in September. The markets have been extraordinarily volatile in the last month, with the Dow Jones and S&P 500 falling 8.7% and 8.6%, respectively. Gold prices tend to climb when interest rates are lower, so any news about the Fed raising interest rates will send prices down. Rising interest rates would also strengthen the dollar. That's important because gold becomes more expensive for those with foreign currencies, thus bringing its price down. "Gold has been closely tracking changes in Fed policy expectations of late and we expect this influence on price action to continue up ahead," UBS analysts told The Wall Street Journal. The Federal Reserve will meet on Sept. 16 and 17 to decide whether to raise rates. Despite recent gains, the gold prices today are still down from the highs over $1,300 they hit last December. This offers one the best opportunities to buy the precious metal in a decade, according to Money Morning Resource Specialist Peter Krauth.